After 20 years with Rheumatoid Arthritis I developed Sjogrens Syndrome. It is another autoimmune disease most recognizably showing itself as very dry eyes and mouth. It would have been called Secondary Sjogren’s in the past because it developed with another autoimmune disease, but the classification criteria has changed recently. The dryness affects all areas of the body but is far more noticeable and annoying in the eyes and mouth. I use pilocarpine (salagen) in pill form for my dry mouth. It is a prescription drug. Without it my voice starts to diminish and I cough and choke a lot. It is possible to have a compounding pharmacy make up a mouthwash using pilocarpine but it has a very bitter taste. I also use Biotene Oral Balance at night. Since the lack of saliva makes your teeth more susceptible to decay it is very important to take care of your teeth well. I read that using a night guard when you sleep helps with the saliva production because it is a “foreign body” in your mouth, so I got one. I also clench my teeth and get headaches and this helps with dryness and clenching. You can put a re-mineralizing agent like MI Paste on your teeth under the nightguard to strengthen your teeth. 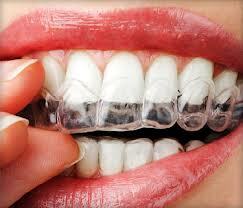 This picture shows a whitening tray but it looks like my nightguard. You can also massage your salivary glands to help stimulate saliva flow. It works best on the large glands near the temporomandibular joint located in front of your ears. At the last Sjogren’s Canada Patient Conference I asked Dr. Yepes if Salagen would keep me from losing function in salivary glands and the answer was no. I did hear that there are usually some salivary glands spared. Up to 50% of your glands can be functional and yet you still feel very dry. I added this picture because in the past my eyes were so dry that I would look at my computer screen with my eyes half closed because they were so dry and painful. The dryness also made me go to bed early sometimes because dryness can makes your eyes feel so sore you just can’t keep them open comfortably. I tried punctal plugs (a doctor can plug your tear ducts so the tears stay on the eye) and they helped somewhat. In fact I have had them in my lower tear ducts for the past six years. Then since I was still dry I was able to try Restasis prescription eye drops and they worked for me. That was a break since they don’t work for everyone. These drops contain cyclosporin and while they do sting a little, it’s worth it for me. I get best results by putting them in my eyes and then shutting my eyes for a few minutes. I use hormones too. Dr Ann Parke has spoken at most of the annual conferences of the Sjogren’s Society of Canada and is a leading expert on the subject. She touched on this subject favourably so I am more reassured about the effects of hormones than I would be otherwise. Hormones help with the vaginal dryness and the frequent UTIs. Sjogren’s is different for everyone, but I find it almost a part time job just to care for Sjogren’s Syndrome alone. I just read today about acupuncture and Sjogren’s in Julia’s Reasonably Well blog about Living Well With Sjogrens She has a great picture of acupuncture points and some useful advice too. Also, I have found www.dry.org to be a good source of practical info from Dr Robert Fox, who is a leader in the field of Sjogren’s Syndrome. If you look for research on PubMed you will find many papers credited to him.